Forbes, a media owner with an ad-supported business model, searches for a middle ground when it comes to serving ad on its site to visitors using ad-blocking software. Late last year, the media property began testing ways to sway site visitors to whitelist Forbes.com after its Web technology identified more visitors with ad-blocking software turned on in their browsers. In exchange for turning off the ad-blocking software, Forbes CRO Mark Howard says the company began testing what he calls an "ad light" experience. 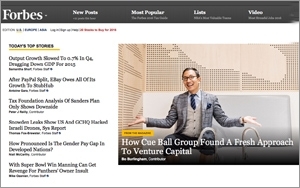 Forbes segmented site visitors using ad-blocking software into two groups. One group went past the opening message on the Forbes site. The second group of ad blockers received a message on the opening page, where visitors usually see the Quote of the Day. The message read: "We know you have your ad blocker on. Please disable it and in exchange you will receive an 'ad-light experience' on Forbes." "We didn't explain what 'ad light' meant," Howard says. The magazine found that of the test group, 44% in the initial pilot whitelisted Forbes, entered the site, consumed content and had an "ad-light experience." Howard says those accepting an "ad-light experience" did not receive a welcome ad when coming back to the site, auto-play pre roll ads, inline videos and interstitials. They receive only "lightweight" ad units on the pages throughout the site. Howard says Forbes doesn't see its search ads running on Google and Bing being affected by ad-blocking software in browsers. Only on its site. Among the reasons that people use ad blocking are protection of their machines against malware and viruses hiding in ads. Protecting visitors has become a priority for Forbes, especially since taking a stand against ad blocking, forcing visitors who want to view its content to disable their ad-blockers and them serving them malware unintentionally. During the next few months, Forbes will test about a dozen variables to see how site visitors react. "We need to find out what visitors will accept knowing we are an ad-supported business model," he says. "This was the first step down the path." 1 comment about "'Forbes' Tests Ways To Sideline Ad Blocking". Barton C. Brassil from Mediaocean LLC, January 30, 2016 at 7:03 a.m.